Over the years we have become famous among our clients and friends for the crazy antics we have gone through to produce our out-of-the-box holiday cards. The only year we did not create an original photo greeting was in 2012, in the aftermath of Hurricane Sandy, when we donated the cost of printing and mailing our cards to those in need. For all of you who have enjoyed receiving our cards, here is a retrospective of some of our perennial favorites. And maybe, if you let us know loud and clear, next year we will once again get in the swing of the holiday season with one of our misanthropic masterpieces. Here’s a visual message that got a lot of chuckles and guffaws… and maybe a few raised eyebrows. When she was in high school Jay’s daughter Jodie, with a gleam in her eye at the dinner table one night, suggested, “Why don’t all the men on your staff dress as women and all the women dress as men? Then use the greeting ‘Don’t let the Holidays be a Drag.’ ” Well, Jay’s family fell off their chairs just picturing that visual and the crew got to work. The resulting card was pretty hysterical. See if you can find Tina 8 months pregnant, Sue checking out the lab guy’s cleavage and Jay as a 50-year-old Marilyn Monroe look-alike on a hairy day. The word around the studio was that everyone already had these “costumes” in their closets, adding a hilarious reality byte to the entire experience. Seriously… it was hard to recognize one another until we got the makeup remover going. Some years our hilarity was tinged with good all-American nostalgia. Our inspiration here was Norman Rockwell’s “Freedom from Want”, one of his most famous works, painted in 1942 to depict one of the four freedoms we were fighting for in World War II. Emulating this renowned painting with photography would certainly be a challenge. To begin with the perspective was almost impossible to mirror in real space and time. We custom-built the table that tapered towards the camera to look like the painting and it was disproportionately narrow to get everyone in the picture. You’ll notice that the overall focus had to be tack sharp front to back… not the way the eye really sees. The table had to be chest-high and, sometimes, chin high just like in the painting, which was crazy looking in the studio. We brought in a friendly art director to finesse the positioning of each character while looking through the lens and examining the original image carefully. Click here to compare our interpretation to the Saturday Evening Post publication and read about the history of Norman Rockwell and this painting. Jay is one of those guys who gets hooked on something and won’t let it go. So year after year he talked about the 24-hour marathon of A Christmas Story aired on TBS. It’s not surprising that so many people recognized and appreciated this card. Even as a grown-up, Jay relates to Ralphie, Flick and the gang as well as Ralphie’s dad, played by Darren McGavin, who reminds Jay of his own father. So the studio agreed to re-enact one of the funniest scenes in the movie, when Flick is dared by his buddies during recess in the schoolyard to lick the rusty ole’ flagpole. 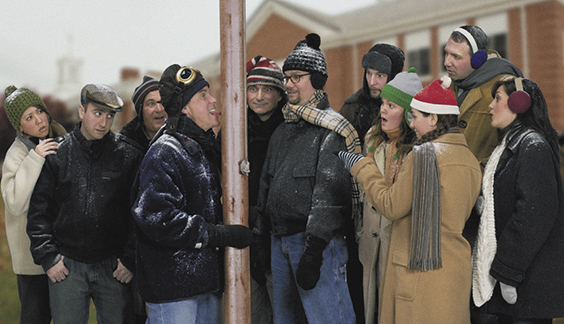 Of course, in the Midwestern, sub-zero winter weather his tongue stuck to the pole causing a mixture of reactions from his friends including guilt, surprise, laughter, ridicule and fear that they would be blamed as they all abandoned the hapless Flick and ran back to class. A lot of our friends and clients remembered this scene in the classic film that takes place in the early 40’s… kind of a generational homage to family-style fun. 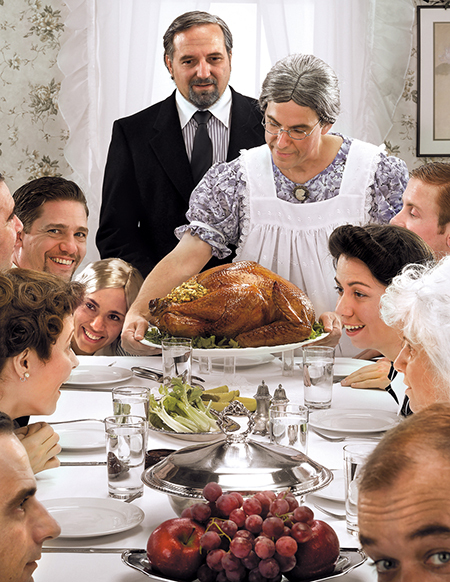 Your friends at Brenner Photo wish you all the happiest, and lighthearted, of holidays.